Mike Rickett M.A. Mike Rickett’s art explores the relationship between space, geometry and colour in an attempt to capture on canvas the physical and non-physical phenomena associated with the modern industrial city, its architecture, dynamism, and complexity. His work encompasses three distinct forms - hard-edge, geometric urban paintings and 3D reliefs as well as two-colour studies of Liverpool scenes and woodcut prints, also mostly of Liverpool scenes. In 2014 he produced six World War 1 studies to commemorate that conflict that went on exhibition throughout the North West in the UK. 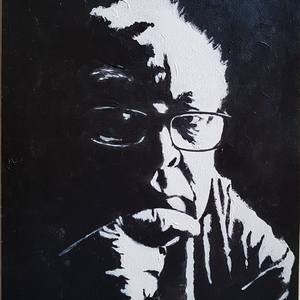 He was also the founder of the Liverpool School art movement in the UK which has the basic aim of redefining urban art in geometric painting, both 2D and 3D, using city life and buildings and transportation as its inspiration – anything which depicts and portrays the rhythms of urban life. As an aesthetic, the urban landscape may be regarded as the vision a society projects about itself into the future. Mike’s work creates structure and a visual language as well as providing references to the past and the future and other dimensions in time and space. Mike has been a student of fine art for eight years, first achieving a Foundation Degree in Fine Art, then a BA (Hons) in 2010 when he was awarded the Liverpool Women’s Hospital Purchase prize. Followed that he embarked on a two-year post-graduate study for an MA by Creative Practice, all at Liverpool Hope University. He previously achieved a BA (Hons) in English at the University of Liverpool. Before the major career change in 2008 he was a senior journalist, mostly in daily newspapers but also for Reuters, the international news agency. Mike has exhibited fairly widely in the North West of England. He has three artworks in the Liverpool Women’s Hospital arts collection. He was the winner of an arts award in 2010 and has a number of commendations for his work. He has a listing in the 36th edition of Who’s Who in Art. Mike was brought up in Powys, mid- Wales, but now lives in Liverpool and has two children – a son in Estonia and a daughter in Canada. He has a studio in Waterloo, on the outskirts of Liverpool.